Video Bath of the Constitution (2015), Courtesy the artist. Mary Zygouri, Bath of the Constitution (2015). Still from the video of the performance. Courtesy the artists. Mary Zygouri was born in Athens and lives and works between Greece and Italy. She is a visual artist and performer and employs various means using performance as her fixed point of reference. Her actions, organized in detail and through in-depth research, usually unfold in public spaces thus provoking unpredictable outcomes and the viewers' critical participation. Her multi-layered body of work addresses concepts and strategies of current site-specific performance expressing very distinct experiences of space and place adopting multiple roles. Through her work history and space turn toward individual and collective experience, claiming through active participation of communities an imaginatively and collectively resistant public space. 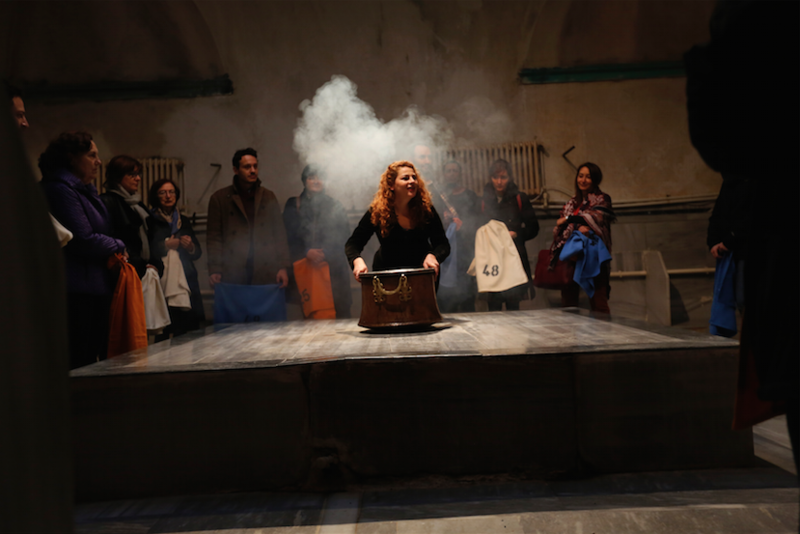 The VENICE INTERNATIONAL PERFORMANCE ART WEEK 2016 presents the video of Zygouri's performance Bath of the Constitution, held at Cittadellarte, IKSV, Istanbul (2015).